Spawning bass cannot escape my desires. Warming waters move my heart to love. I love the smell of burning brush piles in my yard and deer sausage tucked safely in my cargo pants. That was kind of weird huh! Well, I was getting a little emotional. This is the time of year all bass fishermen and women head to shallow waters and see what the “spring run” has to offer. Let’s go catch a big trophy bass! My yard is now clean. My fishing gear, including my trolling motor and battery, is packed in my Chevy Tracker(and deer sausage in my cargo pants) and I am headed to the lake. Yep, I don’t have a boat. I am going to Clarko State Park about an hour down the road, rent me a boat, and do some fishing. I don’t know about you but I just want to get on the water and get it going. 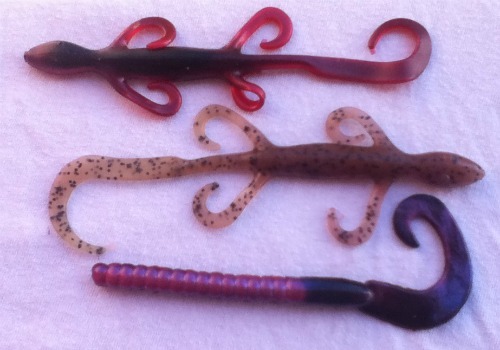 I like to fish with the plastic baits so I carry a few packs of worms and lizards. I buy mainly 6” to 8” in Tequilla Sunrise or Pumpkin Seed/Chartreuse or anything on sale. Ok, now we are out on the water looking for bass on the bed. If you have a pair of polarized sunglasses, take them with you. You will be mad if you don’t. They eliminate the glare on the water so you can see the bass down in the water guarding the bed. Of course if the water is cloudy or stained, it will be harder to spot the bass. If the water is clear, the bass will be easier to spook and harder to catch. Finding spawning bass on the bed is not too difficult. Start on the shallow end, which might be the north end, in 1 to 3 feet of water. Work around the shoreline toward the dam looking for movement. Don’t you love to see those big boils when Miss Big Belly gets irritated! 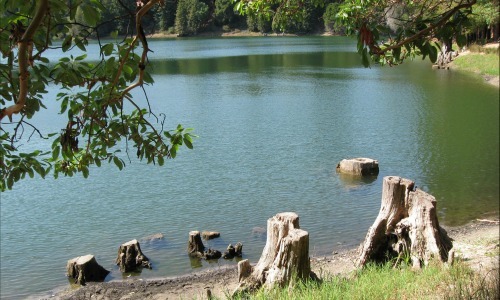 A bed may be deeper at around 5 to 10 feet according to the contour of the lake. The bed also must be in direct sunlight to keep the eggs warm. Spawning bass must be close to cover or have an easy route to deeper water so the big female will have someplace to hide if you mess with her too much. Ok, you found a bed in about 4 feet of water. Now how do you catch a bass on the bed? Well, Miss Big Belly’s job is to guard the bed and keep out all the unwanted creepy crawlies. So it makes sense if you throw something on her bed, then she is going to try to pick it up and move it off the bed. The trick is to get close enough to the bed to half-way see what is going on without scaring her off. If she leaves the bed, just be patient and still because sooner or later she will come back. If you are lucky, this will only happen one or two times before she finally picks your bait up to move it. Something plastic that will stay on the bottom or suspend near the bed will usually work. If you like Flipping and Pitching or the Drop-Shot method, these techniques work pretty good for putting the lure where it needs to be. I prefer to cast past the bed and drag a worm or lizard on top and let it sit there. Rigging it weightless is a good way to use this lure because it gives it a more natural movement. Then I twitch the lure just a little to make the big mama mad. If she picks it up by the tail then you can’t get a hook set. But if she picks the whole thing up in her mouth then you might have a trophy bass to fight with. Line choice is an important key. Fluorocarbon line is the best choice because it sinks and it is invisible. An 8-12 pound test line that sinks helps to keep the lure down in the water. Invisibility is important so the bass will not see the line and run off the bed. Spawning bass are fun to catch but it is also a challenge so you need all the advantages you can get. Make your presentation with the least splash as possible, be patient, be observant and catch some big bass on the bed.